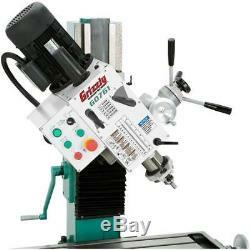 Grizzly Heavy-Duty Benchtop Mill/Drill with Power Feed and Tapping. This item is brand new in factory packaging and covered by our. Looking for a Benchtop Mill/Drill with tapping capabilities that can rival the accuracy and rigidity of a knee mill? Then take a good look at this machine! With the dovetail column, table ways, and high-precision P5 spindle bearings, youll be making perfect cuts all day long with repetition and ease. Changing spindle speeds is fast and simple with the gearbox levers, and getting the perfect table feed is as easy as dialing-in the variable-speed power feed on the 9-1/2" x 32-1/2" table. This Heavy-Duty Mill/Drill with Power Feed has it all! Motor: 2 HP, 220V, 1-phase, 8.6A. Table size: 9-1/2" x 31-1/2". Table travel (X-, Y-Axis): 22", 7-1/2". Spindle speeds: 6, 901970 RPM. Head tilt: 45° left & right. Table T-slots: 1/2" wide, 3-1/8" OC. 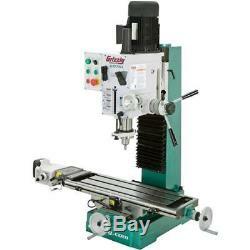 Overall size: 49-5/8" W x 57" H x 30-3/4 D. Base footprint: 17-3/4" W x 21-5/8" D. Reversible spindle & tapping controls. Dovetail ways, each with adjustable gibs & dual locks for accuracy. Coarse/fine spindle downfeed with stops. We are committed to your satisfaction. Since our inception in 1983, Grizzly Industrial®, Inc. Has grown into one of the largest machinery companies in the. Our products can be found in all sizes of shops from the large industrial production users to the smaller cabinet and machine shops. The item "G0761 Heavy-Duty Benchtop Mill/Drill with Power Feed and Tapping" is in sale since Thursday, September 27, 2018. 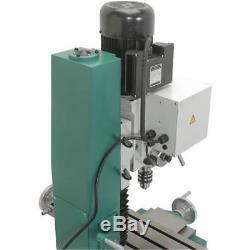 This item is in the category "Business & Industrial\CNC, Metalworking & Manufacturing\CNC & Metalworking Supplies\Equipment Specific Tooling\Milling". The seller is "grizauctions" and is located in Bellingham, Washington. This item can be shipped to United States.